Major General Andrew Jackson Smith, commanding the Right Wing of the 16th Army Corp, is on his way east to join Major General William T. Sherman’s Atlanta campaign. The Federal commander in Missouri, Major General William S. Rosecrans keeps hearing reports that Confederate Major General Sterling Price is planning to invade Missouri. Much to Sherman’s annoyance, Rosecrans convinces the US War Department to divert A. J. Smith’s command into Missouri to counter the Confederate cavalry raid. Smith’s objectives are to bring Price’s Army of Missouri to battle and destroy it. This book tells the story of how A. J. Smith’s command is diverted to Missouri to defend the state against Sterling Price. Find out if Smith's operations against Price in the fall of 1864 are successful. 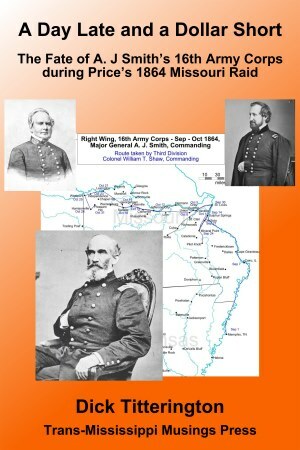 Learn about the difficulties in managing a campaign in 1864 Missouri. Understand some of the personalities of the Federal commanders who are the key decision makers in Missouri during Price's raid.